Adding Report Options to your report allows others to select specific filters to narrow down the information they want to view. The NL("Lookup") function can be used to allow users of the report (either Designers or Viewers) to see and select from a list of available values when setting their Report Options. The most common (and basic) use of the NL("Lookup") function is to simply pull a list of values from the database. Multiple fields can be displayed by placing them in an array. This is accomplished by creating the list of fields to be displayed, separated by commas, in the Field parameter and surrounding the list with curly braces. Only the first field in the array is the field that will be returned by the Lookup form. In addition to selecting multiple fields to be displayed in the list, it is also possible to customize the headers that appear at the top of each column in the Lookup window. This can be done by placing "Headers=" in one of the FilterField parameters of the NL("Lookup") function. 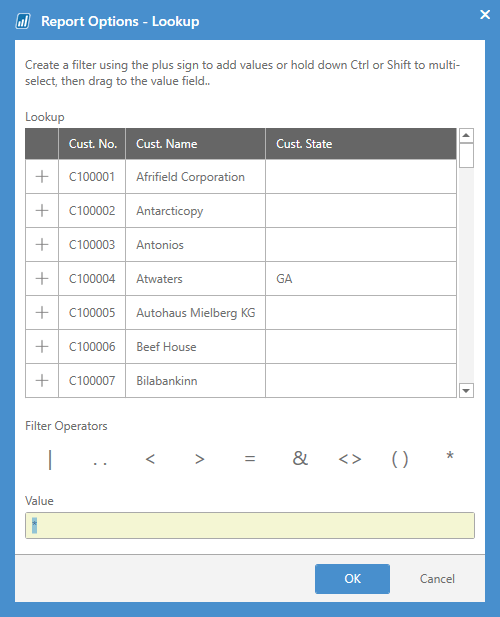 It is also possible to manually specify the values that will be displayed in and returned by the Lookup window. This allows you to present the user with a list of values that are not stored in your database. The syntax that will be used is slightly different. Since data is no longer being returned directly from the database, the Table parameter is no longer used to specify the table that the information will pull from. 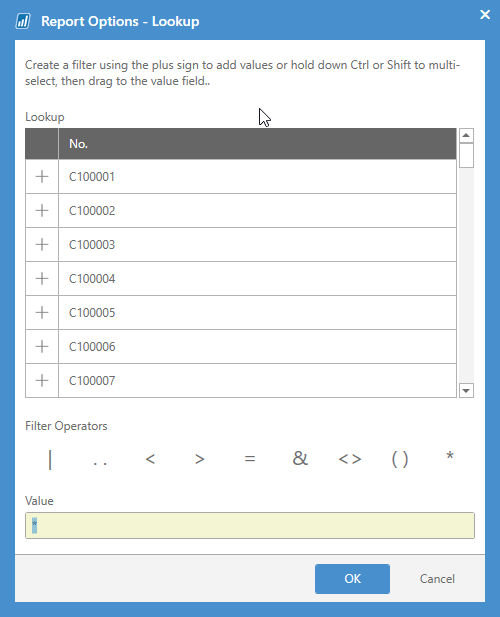 Instead, an array containing the values to be displayed is placed in the Table parameter of the Lookup function, Headers= must be used in the FilterField parameter, and the Field parameter will contain the list of column headers of the Lookup window. 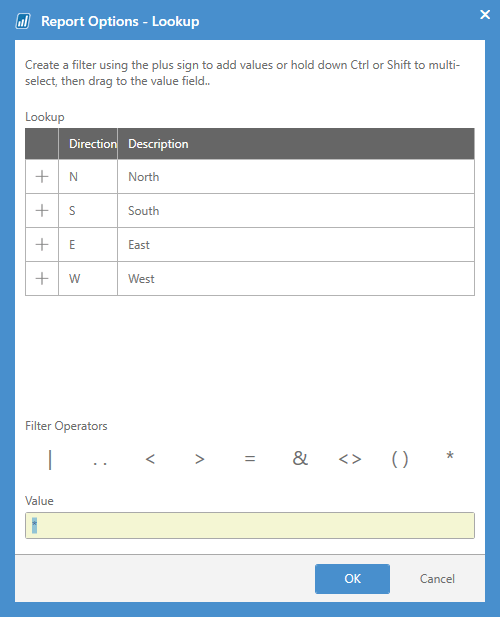 It is important to place the field name that will be displayed at the top of the Lookup window (in this example Direction) in the Field parameter. Omitting this will prevent any values from being displayed in the Lookup window. In addition to placing the values in the NL("Lookup") function itself, a cell reference can also be used. The following example will display the same result as the previous example, but the values are specified by a cell reference instead of text. We can also utilize cell references to display multiple columns in the Lookup window. To achieve this, we'll include another column of values next to the values that we are already displaying. Once this is done, we'll expand the cell range in the NL("Lookup") function to encompass both columns of data. Since multiple columns are now being specified, our NL("Lookup") function will also need to include the names for these columns. This is done by using the same array syntax that was described above in order to specify the field names in the Field parameter. In some instances. we may want to have the values which are displayed in one NL("Lookup") function to be based on the results that were selected in another NL("Lookup") function. An example of this could exist in a Sales Report. The viewer will have the ability to select a Salesperson Code and will also be able to specify Customer Numbers in order to filter the report further. If only one Salesperson Code is selected, we'll want to display only those Customer Numbers that are associated with that Salesperson. The next NL("Lookup") function will give the viewer the ability to select from a list of Customer Numbers, but it will be filtered based on the Salesperson Code that was previously selected. This is done but inserting a normal filter into the function and referencing the cell containing the Salesperson Code that was previously selected by the viewer. However, if a particular Salesperson Code is selected, then the resulting list of Customer Numbers will be much smaller. This is because the NL("Lookup") function that is returning the list of Customer Numbers is now filtering on the Salesperson Code that was selected, and thus, only returns Customer Numbers associated with that Salesperson Code. Another useful feature of the NL("Lookup") function is the ability to specify how many records the Lookup function will go through in order to create the list of values that will be displayed. By default, the Lookup function uses the value that is set for Maximum Lookup Records Scanned in the Jet Application Settings. The default is 1,000 records. If the number of desired records to be searched is larger than this setting, the ScanLimit= keyword can be utilized. The NL("Lookup") function normally returns all values (for the particular field) that are found in the table specified (based on the limit discussed above). For fields defined in NAV as "Option" fields, it may sometimes be desirable to display *all possible* values - regardless as to whether those values are present in the table or not. For this, a useful feature is the SmartLookup= option.